Hey yall!!! Last week of our Thanksgiving series and I am bringing you the perfect Thanksgiving dessert! Now for this series I have focused on making the holidays easier on ya. My appetizer was a simple Cranberry Pepper Jelly Dip that is made in 5 minutes with 3 ingredients! For main course and side dish I did a Slow Cooker Cranberry Pineapple Ham and a Slow Cooker Stuffing to save space in your oven and save you time. 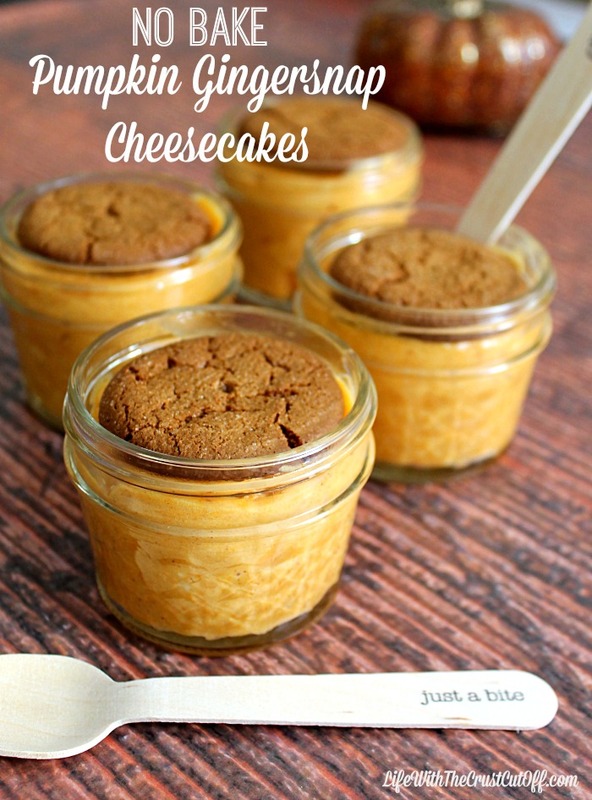 Now for dessert I am bringing you these amazing No Bake Pumpkin Gingerbread Cheesecakes. These babies take 5 minutes to make and use 4 ingredients. They are delicious!! I could not stop eating these, thankfully I made them in these cute little mason jars! My mom loves pumpkin pie but she doesn’t care for the crust so this is a perfect dessert for her, plus I mean hello cheesecake!! This is one holiday dessert that has it all, super fast, just a few ingredients and they are absolutely scrumptious!! These mini no bake cheesecakes are perfect for Thanksgiving, Christmas, potlucks, parties, holiday dinners and the best part you can put a lid on them and send them home with your guests. So all you do is mix pumpkin, cream cheese, powdered sugar and pumpkin pie spice, top with a gingersnap and you’ve got a showstopper of dessert that took you minutes to make and taste out of this world!! 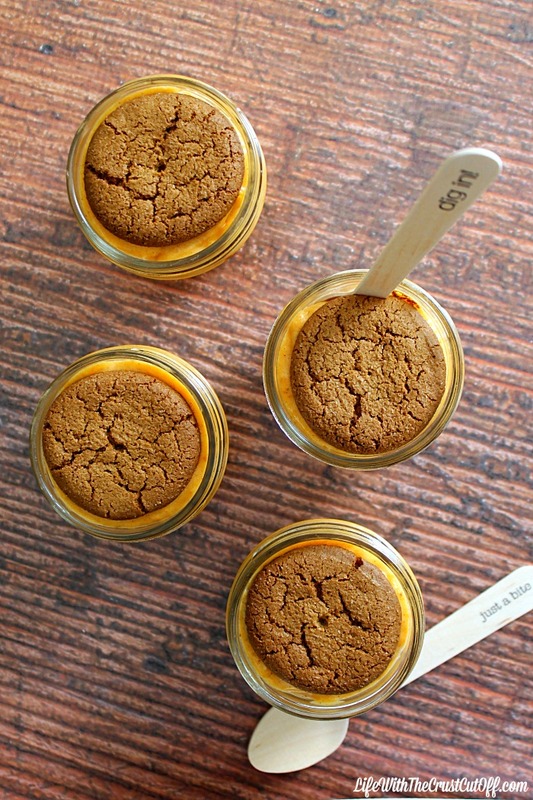 So don’t stress this holiday season whip up these fast and yummy little jars of pumpkin bliss and wow your guests without even opening the oven! Whip together the cream cheese, pumpkin and pumpkin pie spice. Gently blend in the powdered sugar. Spoon mixture equally into little mason jars. Don’t forget to head on over to Dana’s and check out her Mini Pumpkin Pie Cups, yum!! Don’t forget to check back next week when we will start our Christmas Series and bring you all sorts of fabulous yummies to help you have the perfect holiday season!! Yum, this looks really good! And I love how easy it is to put together! I love these! Pinning to the Monday Funday board! Wow, those look great! I am a BIG fan of pumpkin AND cream cheese. I love that they’re no-bake, and super quick to prepare. I totally want to give your recipe a try, but I’m thinking of cutting the sugar, or switching it out for some raw honey. Do you think that would work? Oh definitely!! I actually started out trying to make them into balls, hence the powdered sugar lol. I would actually start at 1 cup of sugar and go from there! totally a dream dessert here! pumpking, gingersnaps, cheesecake…….I object to the small size though as eating three of these will make me feel like I am a piglet lol. I am going to have to make these for sure Parrish, appreciate your sharing with us! We miss you co-hosting with us at Snickerdoodle and would love you to co-host with us again sometime! Lol!! I agree! Next time bigger jars for sure!!! Congrats Parrish! 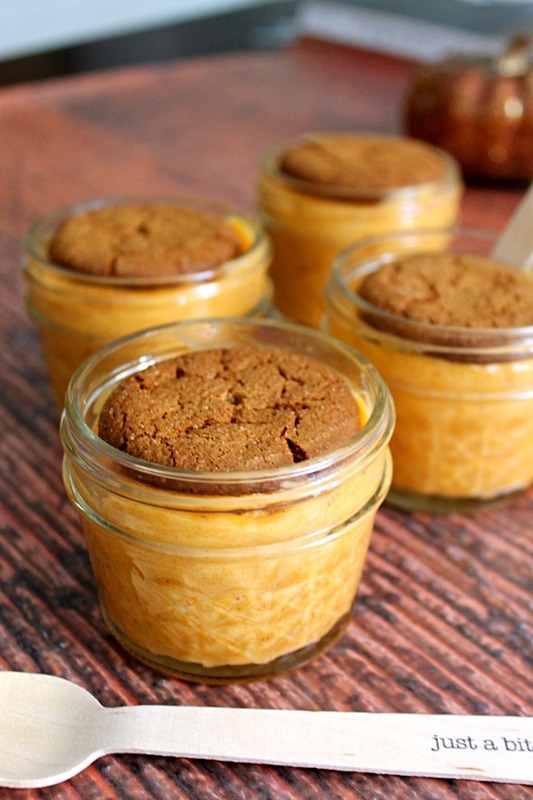 We will be serving these delish Pumpkin Gingersnap Cheesecakes at this weekends Snickerdoodle Sunday!! So creative and I love gingerbread!